Tender chicken marinated in a homemade sauce, skewered with your favorite vegetables and grilled to perfection. Salty, sweet Teriyaki Chicken Skewers are a quick and easy meal that everyone loves! 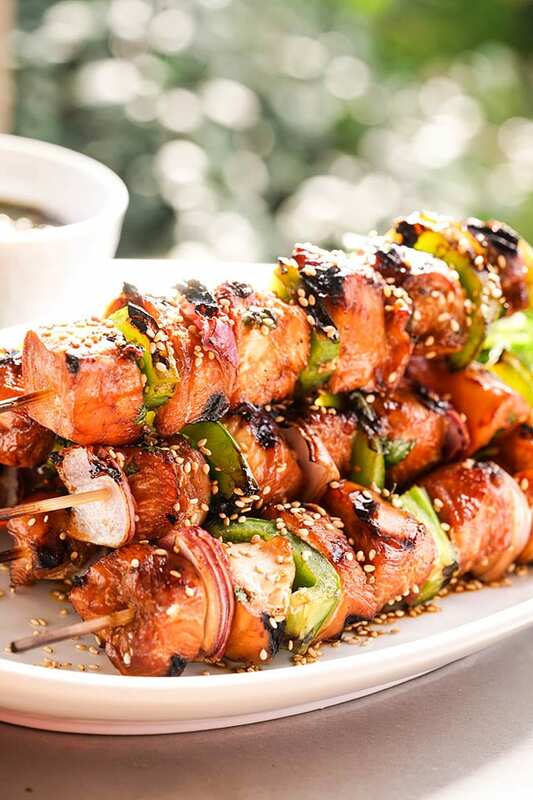 Easy to make Teriyaki Chicken Skewers are a family favorite! Hey guys, it’s Deb stopping by from Bowl Me Over to share another yummy recipe! Since it’s now officially spring – YAY!! 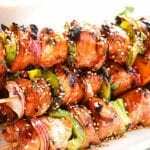 – I thought I’d kick off the season with one of my favorite grilling meals – Teriyaki Chicken Skewers! I love a great teriyaki and have a couple of meals on the blog you should be sure to check out Teriayki Noodles that are better than takeout and Teriyaki Chicken Bowl! What can I say, I love that salty/sweet combination! It all starts with an easy Homemade Teriyaki Sauce! Now it only takes about 5 minutes to put this marinade together. It’s so simple and 100 times better than what you get in a jar. Now if you do choose to take a shortcut, hey! 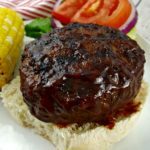 No judgment – either way, you’ll love this meal! Be sure to make extra because everyone will want more than one! What is teriyaki sauce made of? The main ingredients in teriyaki are soy sauce, brown sugar and ginger. It’s easy to make and you probably have most of the ingredients on-hand. 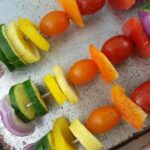 What vegetables and fruit can you add to kabobs? How do you make grilled teriyaki chicken skewers? 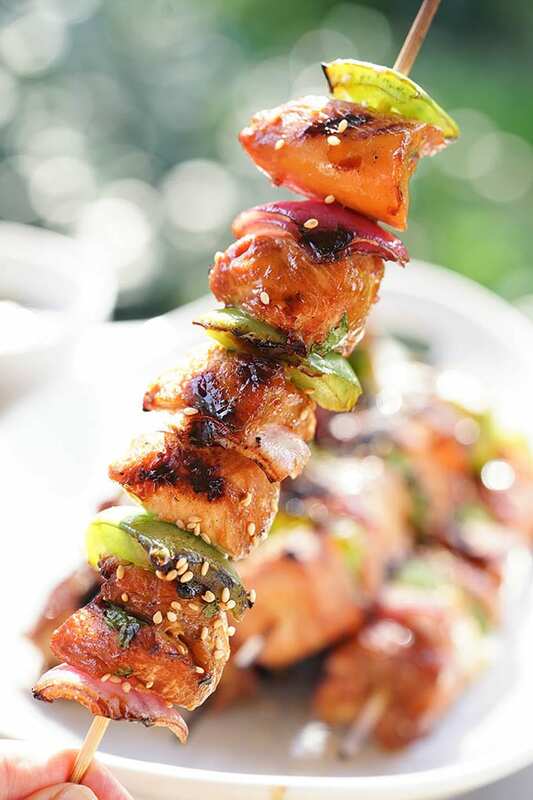 If using wooden skewers be sure to soak them for at least 30 minutes prior to grilling. Dice the chicken into small 1 1/2 inch pieces. Add to the marinade, allow to soak for 30 minutes. Dice the vegetables into 1 1/2 inch pieces. Assemble the kabobs alternating meat and vegetables. Grill for about 6 minutes each side. What’s your favorite kabob? I tell you I love this meal! 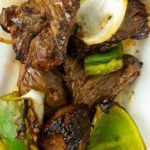 More great kabob recipes I know you’ll love!! Thanks for letting me share one of my favorite recipes, I hope you give it a try! If you love it, be sure to leave a comment below to let me know! I’d also love it if you’d swing by the blog to visit! 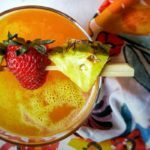 I share a ton of quick and easy recipes I think you’d really love! Right now I’m giving away a FREE Cheat Sheet with everything you need to know about using your Instant Pot. Click below to get yours! Plus, don’t forget to to enter the Instant Pot Giveaway. 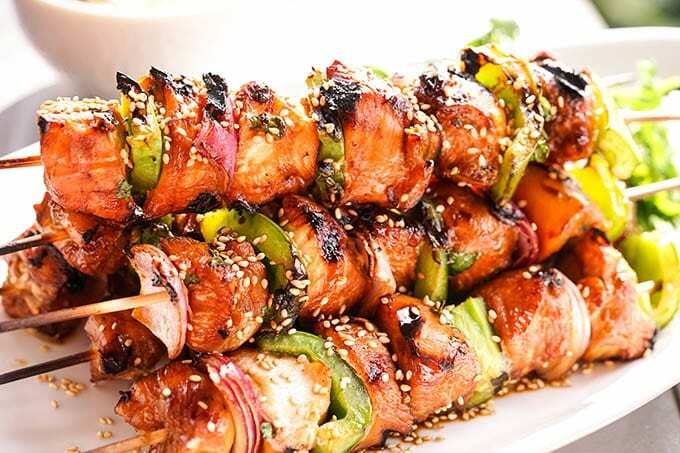 Teriyaki Chicken Skewers with tender chicken marinated in a homemade sauce, skewered with your favorite vegetables and grilled to perfection! Soak wooden skewers for at least 30 minutes prior to grilling. Combine the ingredients for the marinade, place in a large bowl. Dice the chicken into 1 1/2 inch pieces. Add to the marinade, allow to soak for 30 minutes. Grill for about 6 minutes each side or until the internal temperature is 160 degrees F. Do not overcook, nobody likes dry chicken! I hope you get a chance to try this recipe soon. These looks so good! I am going to give these a try!